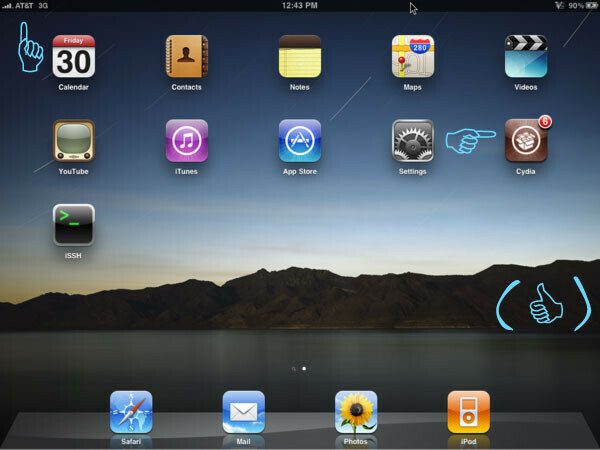 It's assumed that there are plenty of new Apple iPad 3G owners soaking in the joys of finally being able to get their hands on Apple's latest device that's stirring up a large following. Since its introduction, it was well known at how Apple would try to lock down the device in many ways from both the software and hardware end. Aside from the relatively unpopular micro SIM cards required to get the iPad 3G up and running on AT&T's network, there are still some apps that are locked down on the venerable device. Thankfully after the original Wi-Fi only iPad got jailbroken roughly a month ago, the iPad 3G is now getting the same treatment that removes the Wi-Fi only restriction placed by AT&T on the ABC player app. Aside from that, there are still a multitude of other neat things one can do with a jailbroken iPad – such as running an N64 emulator. Gotta jailbreak it to do anything cool, of course. Now crApple will issue a mandatory OTA update and brick them. I'm actually totally for you on this one. To release such a device without multi-tasking and then announce a month later that multi-tasking is just a few months away is kinda stupid.. If the iPad god multitasking from the beginning - than maybe it wouldn't be so almost useless right now.. Damn, we rarely agree, lol. if it wasn't for jailbreak would apple devices be as popular as they are?